Very sweet! I love this image, it seems an old photo! Thank you for sharing! Awwww, this is cute! I loved it! 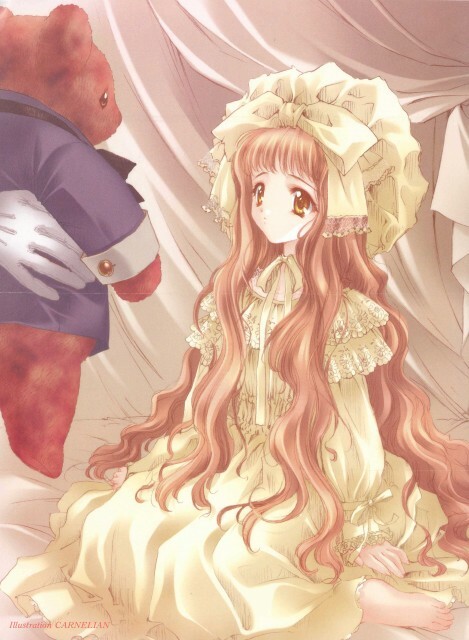 Her outfit is very frilled and teh bonnet is so puffed and cute! Is it a nightgown? I think so. The teddy bear is pretty too, I love teddy bears especially ones wearing smoking :D! Beautiful scan! I like her hair and her dress! love the costumes i notice there are a lot of random hands interacting with the main girl in the pick, but you cant see the rest of the person. kinda weird.